In the agonizing moments between the end of the race and the results being posted, El Capitan’s girls cross country coach Tyler Ludwig did not want to overplay his hand. Four Vaqueros finished in the top 15 of the Girls Division III race at Friday’s CIF San Diego Cross Country Finals, but the team totals were still being calculated when Ludwig took his superstitious precautions. 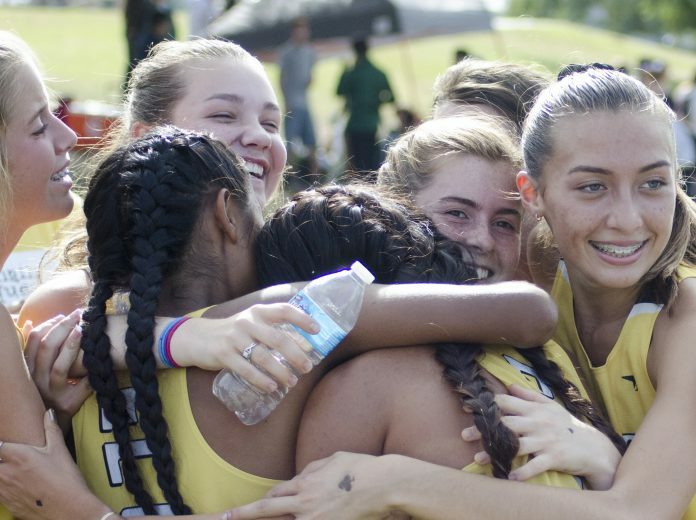 El Capitan’s girls celebrated their first CIF championship since 1993 when the results were finalized and not a moment sooner. The Vaqueros finished with 68 points, just nine ahead of second-place University City. Tamayo finished 13th with a time of 19:42.50, the fourth-best time on the team. Ahead of her were junior Carolinh Calvert (second, 18:40.60), junior Evelyn Anderson (sixth, 19:40.20) and junior Dayana Lopez (11th, 19:40.20). Each one of them had a stamp of a different playing card suit on their hands. Freshman Sofya Chernyak was the Vaqueros’ fifth scoring runner, placing 37th with a time of 21:17.80. Calvert said watching the El Capitan boys win their own Division III title earlier in the day helped motivate the girls. The Vaqueros boys’ team ran away with the lead in its race by placing all five of its scoring runners inside the top 20. Senior Matt Machnov won (15:43.40), junior A.J. Sager placed second (15:55.90), senior Joey Hart was ninth (16:23.30), sophomore Parker Dixon finished 10th (16:24.40) and senior Leland Hayley rounded out the scoring with a 17th-place finish (16:46.10). Machnov has been dominant all year, winning every race except for two. He said he let off the gas early in one, and Sager passed him. He also lost to Grossmont senior Jonathan Rodriguez-Gomez, who finished fifth in the Boys Division II race, in a dual-meet against the Foothillers. Machnov and Sager are friends with Rodriguez-Gomez once they cross the finish line. The girls also had their fair share of sportsmanship. While waiting for the results, the Four Aces congratulated University City senior Ella Ruff on finishing sixth in the Girls Division III race. Of course, the coaches were also doing everything in their power to help the teams improve. El Capitan boys cross country coach Jeff Hines said Ludwig was even trying to tap into other-worldly powers with his wardrobe. Or maybe luck is just easier to come by with aces up the Vaqueros’ sleeves.